Our friends at AirTurn are celebrating NAMM with a sale on all their gear! The AirTurn BT-105 bluetooth footpedal works great with DeepDish GigBook. And pair that with a The GigEasy's iPad music stand/holder and you'll be set for any gig. The sale ends on the 22nd. 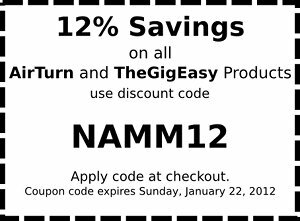 To take advantage of the sale click on the add below and use the code "NAMM" when you check out. If you are going to NAMM make sure to check out DeepDish GigBook on dislplay at the AirTurn booth, in Hall E, Booth #1101.